In a tiny room on a top floor of the St. Regis Hotel in San Francisco, nine online journalists–many of them barely out of college (myself excluded; I could have been their mother)–were crammed around a similarly proportioned conference table, all of us looking very much like the unescorted guests stuck at a back table at a wedding reception. We were all there for the same purpose. Our goal was to have a brief conversation with the couple at the head of the table: Sofia Coppola and Stephen Dorff, the director and star of the movie “Somewhere,” scheduled to be released December 22. Both in their late 30s, the couple could be oddly matched newlyweds. Sofia Coppola is a quiet, guarded woman with an economy of manners–during public appearances, she is often as still as a portrait. This in no way implies a lack of presence; you can tell behind those beautiful, penetrating eyes of hers that there is a perceptive observer behind the patrician air. She is, after all, one of those filmmakers who takes observations from her own personal experience and puts them in her movies. That’s one of her strengths as a filmmaker, a keen eye for the highly specific moments in life that speak volumes, when the particular unveils universal themes. What was she looking at now? Will she put our little roundtable discussion in her next film? Certainly, some of our questions could provoke laughter (here, I am not excluded), and Ms. Coppola is drawn to the humorous. Her latest movie “Somewhere” did indeed contain a very funny, though scathing, re-enactment of a typical vacuous press conference, which made me at least ponder how our little encounter might provide fodder for another film. At Sofia Coppola’s side was Stephen Dorff, who plays the lead character Johnny Marco in “Somewhere.” Mr. Dorff looked like he just got out of bed; or perhaps, never got to bed at all. As I gazed at his face–a gently considerate and boyishly handsome one–I couldn’t help but marvel at the similarities between him and the character he plays, a famous actor who seems caught in the cusp of a wave of celebrity, living a hedonistic existence at the Chateau Marmont in Hollywood. Sipping a beer during the interview, Mr. Dorff even commented that the beer was a Johnny Marco moment. His remark couldn’t have been more revealing–how much of Stephen Dorff is Johnny Marco, and how much of Johnny is really Stephen? When another journalist asked if his mother’s recent passing had influenced him during the shoot (his mother died a year to the day he was given the part), Mr. Dorff confessed to feeling empty and lost inside after losing his mom. “The experience of being in this movie, after such a huge loss, makes the movie feel like a savior to me,” he admitted. 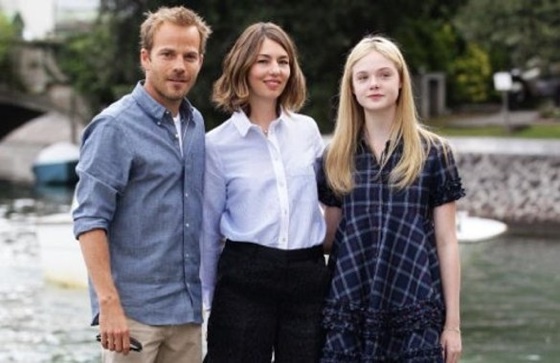 Much like the character of Johnny Marco’s 11-year-old daughter Cleo (effortlessly played by Elle Fanning), who comes to stay with him and to help drag him out of a bad place in his life, Sofia Coppola has given Stephen Dorff a jolt to his own life and career. The synergy of being offered the role at a time in his life when he needed it, both professionally and personally, isn’t lost on the actor. “It’s a role my mother would have been happy to see me play,” he added, saying that all the dark “bad guy” roles he played always scared her. After a joke about not having to worry about continuity during a long take early in the film where Mr. Dorff smokes a cigarette from beginning to end, Ms. Coppola enjoins that her purpose in shooting much of the movie in real time was to show the character of Johnny Marco in between big moments. “I wanted the audience to be alone with this guy,” she said, “to get to know him.” Mr. Dorff also alluded to how naked and raw it felt playing this character, in which the “acting” had more to do with finding an “unconscious space” (Mr. Dorff’s term) rather than thinking about beats and changes in behavior. When the conversation turned to the movie’s open-ended ending, Ms. Coppola returned to her idea of Johnny Marco’s ultimate aloneness, intoning that not even his daughter can save him, not even his ex-wife, who rebuffs Johnny’s pleas for comfort when he reaches out to her in a late-night phone call. “There are moments in your life when you have to confront yourself, and grow up,” she said at one point, thereby clearing up my own confusion about whether the movie’s end hailed a positive or a bleak future for Johnny. As for Mr. Dorff’s own future, he understands the obvious fortune of having been a part of “Somewhere.” Perhaps the movie’s end is a harbinger of a new stage in Mr. Dorff’s own career. Seeing him with Sofia Coppola at his side, I felt he couldn’t be in a better place, and for once, my own smile at such a thought hadn’t a trace of irony.